Our dancer-in-chief, Jennifer Morrow, is going for her third win tonight. What will the new week bring? A situation verrrrrrrrrrry similar to what we saw on Friday. For those of you interested in Jennifer’s charity, Operation Backpack, here’s the link. If Jennifer doubles her score, she’ll have 29,000. 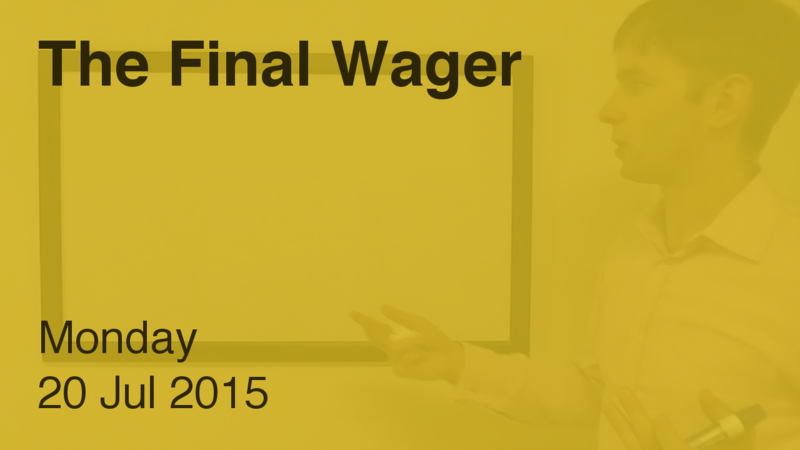 To cover this all-in wager, Scott will need to wager 11,400. An incorrect response with that wager will leave Scott with 6,200. To stay above his total, Jennifer can wager up to 8,300. Mary can wager up to 1,800. A successful doubling will put Mary at 16,000. To cover this, Jennifer should wager at least 1,500. Scott could wager at most 1,600. Mary would need to wager at least 5,000. Might as well go all-in then. If Jennifer makes the rational maximum wager of 8,300, Scott will need to wager 5,200 to cover her. To stay above him, Jennifer can wager up to 2,100. Mary might consider risking at least 4,400. Again, all in. For Mary’s 1,800 wager, Jennifer could go up to 4,700, and Scott up to 7,800. But Scott would need to wager 1,600 to cover that 4,700 wager out of Jennifer… and so the plot thickens. Scott pulls out the lone correct response… and our streak without a three-game winner will enter its 17th game tomorrow.